The outgoing Regional Head of the State Bank of India’s UK operations, Sanjiv Chadha, has been awarded the Freedom of the City of London, in recognition of his outstanding contribution to promoting UK-India relations. Mr Chadha took up his position at the helm of the 98-year-old London office of the State Bank of India in 2014. The bank announced the launch of its UK subsidiary in April of last year. He is succeeded in his role by Sharad Chandak, who was also present at the ceremony. Mr Chadha was nominated for the Freedom of the City of London by the Lord Mayor of London Peter Estlin and Sheriff Vincent Keaveny. His Freedom ceremony at Guildhall on Monday began with him reading aloud the Declaration of a Freeman and ended with him being greeted by Murray Craig, Clerk to the Chamberlain's Court, as a ‘Citizen of London’ and the presentation of his framed parchment certificate.He is the latest distinguished Indian national to have received the Freedom. Previous recipients include Jawaharlal Nehru, the first prime minister of the Republic of India in 1947. Lord Mayor of London Peter Estlin said, “The Freedom of the City of London is a very special and ancient tradition, bestowed to recognise an individual’s remarkable contribution to London or public life, or an outstanding achievement. 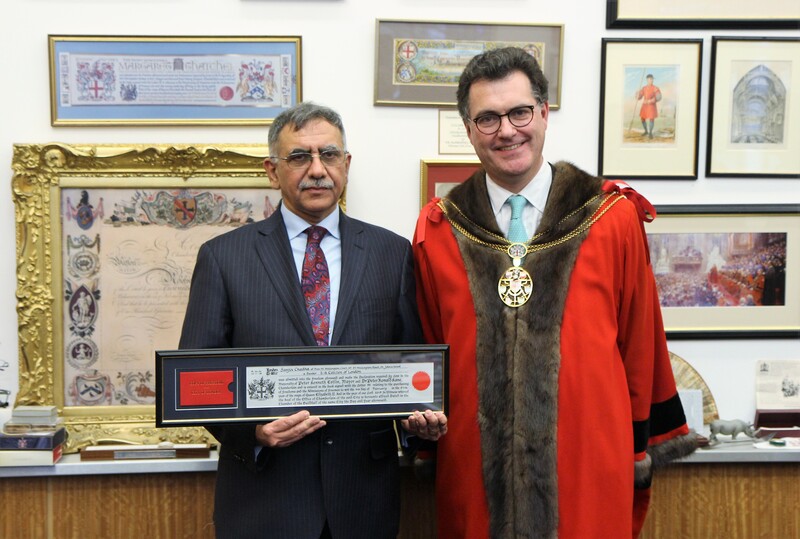 “My colleagues and I are delighted to nominate Sanjiv Chadha for the Freedom of the City of London. He’s been an excellent voice leading the Indian banking community and overseeing significant investment into the City.